WGNC member Steve Criscenzo will demonstrate his methods and technique for making multi-axis pepper mills at the May 11 meeting of the guild. The 7pm meeting will again be at the NC State Crafts Center in Raleigh, and include a member raffle, instant gallery and critique. Members are invited to bring up to 3 pieces to be photographed and critiqued in the gallery. 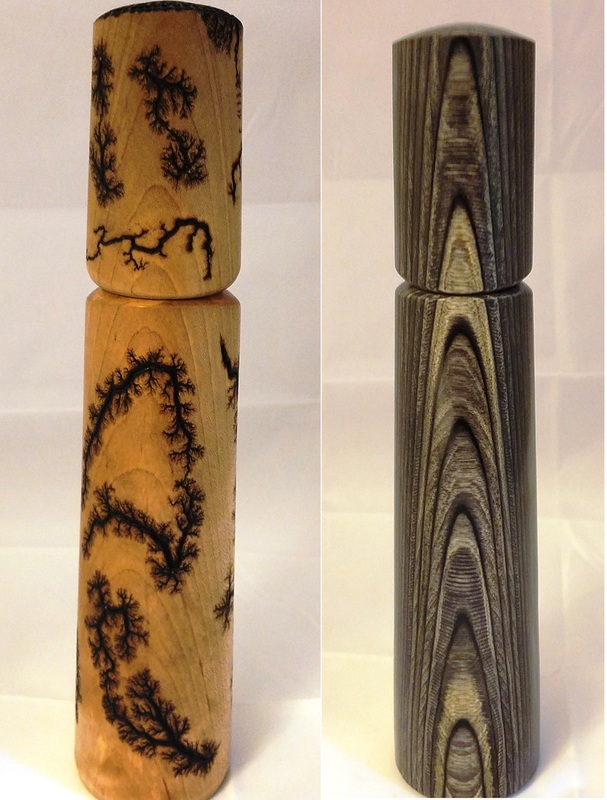 Turning pepper mills can be a fun way to hone your spindle turning skills. They also offer endless design opportunities, make great gifts, and are popular items at craft fairs. The classic design of pepper mills often is composed of a series of coves and beads. "This design can produce a pleasing shape but it can often hide the true character of the wood and may not fit well into contemporary kitchen designs," Steve writes. "My desire for a sleek, simple design that could highlight figured wood lead me to experiment with multi-axis turning." Inspired by the work of Barbara Dill, Steve turns mills on three different axis. This results in a contemporary look that transitions from round to oval and offers a pallet to showcase figured wood or custom finishing or texturing. With a bit of practice you can easily produce mills of similar shape and size that can then be paired for use for both salt and pepper (a strong selling point). This demonstration will show the process from design to finishing for these pepper mills including design considerations, selection of a mechanism, accurate drilling for the mechanism, multi-axis turning, final assembly and finishing.